Kuyavian-Pomeranian Voivodeship, also known as Cuiavian-Pomeranian Voivodeship or simply Kujawsko-Pomorskie, or Kujawy-Pomerania Province (Polish: województwo kujawsko-pomorskie [vɔjɛˈvut͡stfɔ kuˈjafskɔ pɔˈmɔrskʲɛ]), is one of the 16 voivodeships (provinces) into which Poland is[when?] divided. It is situated in mid-northern Poland, on the boundary between the two historic regions from which it takes its name: Kuyavia (Polish: Kujawy) and Pomerania (Polish: Pomorze). Its two chief cities, serving as the province's joint capitals, are Bydgoszcz and Toruń. The Kuyavian-Pomeranian Voivodeship was created on 1 January 1999, as a result of the Polish local government reforms adopted in 1998. It consisted of territory from the former Bydgoszcz, Toruń and Włocławek Voivodeships. The area now known as Kuyavia-Pomerania was previously divided between the region of Kuyavia and the Polish fiefdom of Royal Prussia. Of the two principal cities of today's Kuyavian-Pomeranian voivodeship, one (Bydgoszcz) was historically located in Kuyavia, whilst the other (Toruń) was an important town of Royal Prussia. The functions of regional capital are split between Bydgoszcz and Toruń. 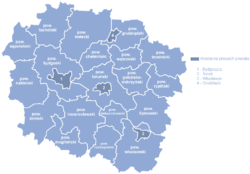 Bydgoszcz serves as the seat of the centrally appointed governor or voivode (Polish: wojewoda), while Toruń is the seat of the elected Regional Assembly (sejmik), and of the executive elected by that assembly, headed by the voivodeship marshal (marszałek województwa). The Kuyavian-Pomeranian Voivodeship is bordered by five other voivodeships. These are Pomeranian Voivodeship to the north, Warmian-Masurian Voivodeship to the north-east, Masovian Voivodeship to the east, Łódź Voivodeship across a short boundary to the south, and Greater Poland Voivodeship to the south and west. Transportation infrastructure is of critical importance to the voivodeship's economy. Kuyavia-Pomerania is a major node in the Polish transportation system. Railway lines from the South and East pass through Bydgoszcz to connect to the major ports on the Baltic Sea. In addition to this, Bydgoszcz is home to the rolling stock manufacturer PESA SA, Poland's largest and most modern producer of railway and tram products. The province's sole international airport, Ignacy Jan Paderewski Airport, is located in Bydgoszcz and has connections to a number of European destinations as well as Warsaw, which are all operated by either Irish carrier Ryanair or LOT Polish Airlines. The main railway stations of the province are Bydgoszcz main station and Toruń main station; both stations are served by fast PKP Intercity trains which connect them with the capital Warsaw, as well as other major Polish cities. In addition to these fast express services, inter-regional trains are operated by the firm Przewozy Regionalne, whilst domestic rail transportation within the voivodeship is provided by Arriva RP, a private firm to which the provincial government subcontracted the provision of rail transport. All major towns of the province have municipal transportation companies operating buses, whilst Bydgoszcz, Toruń and Grudziądz also have extensive tram systems. The Kuyavian-Pomeranian voivodeship's government is headed by the province's voivode (governor) who is appointed by the Polish Prime Minister. The voivode is then assisted in performing his duties by the voivodeship's marshal, who is the appointed speaker for the voivodeship's executive and is elected by the sejmik (provincial assembly). The current voivode of Kuyavia-Pomerania is Ewa Monika Mes, and the present marshal is Piotr Całbecki. The Sejmik of Kuyavia-Pomerania consists of 33 members. The Kuyavian-Pomeranian Voivodeship is divided into 23 counties (powiats): 4 city counties and 19 land counties. These are further divided into 144 gminas. Protected areas in Kuyavian-Pomeranian Voivodeship include the nine Landscape Parks listed below. ^ "Kujawsko-Pomorskie invites you!". Urząd Marszałkowski Województwa Kujawsko-Pomorskiego. 2007. Retrieved July 31, 2011. ^ Arkadiusz Belczyk, Tłumaczenie polskich nazw geograficznych na język angielski Archived 2016-03-03 at the Wayback Machine [Translation of Polish Geographical Names into English], 2002-2006. ^ "Kuyavian-Pomeranian Regional Assembly elections". State Electoral Commission. Retrieved 2011-05-28.